The Ngorongoro Crater is considered one of the most amazing natural wonders of the world and it’s definitely a must-see place in Tanzania. It attracts thousands of people from all around the globe, all year long and sometimes it’s so crowded that people prefer staying there for only a couple of nights and then moving on to the quieter Serengeti. When visiting the crater, visitors also get the incredible chance of interacting with the people from the Maasai tribe. The Ngorongoro Crater is located in Tanzania’s conservation area and it’s the world’s largest unfilled volcanic caldera that is still inactive and intact. This crater was formed almost 3 million years ago when a large volcano exploded and collapsed on itself. It is 2,000 feet deep and the area spans almost 100 square miles. This means the actual volcano was at least 15,000 feet high. The entire Tanzanian safari adventure allows you to experience the most beautiful natural wildlife in all of Africa. The crater itself is surrounded by highlands which form a stunning backdrop. The grounds are most fertile and richest in all of Africa. You have the choice of staying in a hotel located on the rim of the crater, allowing for a breathtaking view, or you could stay a little way away from the crater in Karatu. Karatu will allow for a quieter stay as the hotels at the rim of the crater can get crowded. Plus, the lodges in Karatu offer better value and offer many activities, such as hiking and mountain biking. The Big Five are the five deadly mammals of Africa and it’s actually based on a game on how hard each animal was to hunt. These big five mammals include a rather large population of black rhinos and a smaller population of large elephants that don’t shy away from using their tusks. The crater is also home to many lions, leopards and hyenas. Apart from the big five, other popular animals in the area are herds of buffalo, wildebeest and zebra. 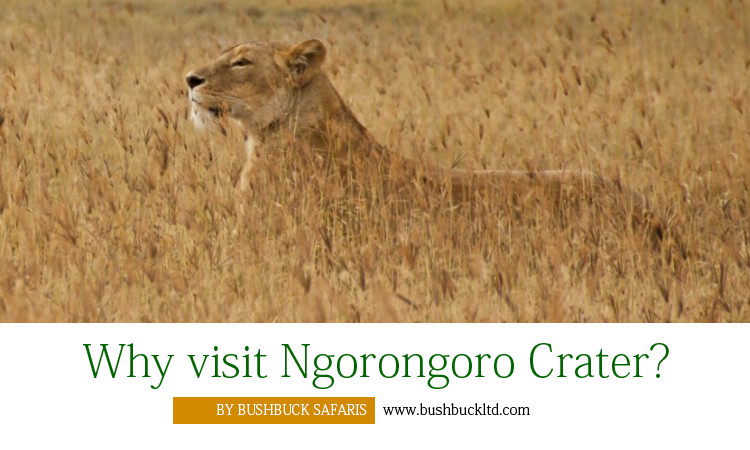 When visiting the conservation area crowds are also able to spot cats, cheetahs, jackals, Grant’s and Thompson’s gazelles, flamingos, foxes and many different species of birds. Apart from being able to absorb the natural wonders of the Ngorongoro crater, visitors can participate in other activities as well. However, to preserve and maintain the habitats, activities are limited to certain areas. There are a few picnic spots but leaving your vehicle is strictly prohibited, for obvious reasons. The conservation area allows for trekking, excursions to Olduvai Gorge and meeting various tribes. The wildlife roams around the crater all year long so there is really no bad time to visit. However, the crater does get really busy, so avoid peak seasons. In the center of the crater is Lake Magadi which has higher water levels during summer months. The bigger the lake, the more flamingos you get to see. Needless to say, whenever you visit the Ngorongoro Crater, it will be nothing but an adventure.